When one conjures to mind the greatest artists of the 20th (and now the 21st) century, a few names bubble into our collective consciousness as being true geniuses, irrespective of their medium, nationality, or personality. Nearly to a person, these individuals have achieved such fame and renown that they are universally referenced by a single name: Picasso, Monet, Matisse, Dalí. I would add to this list the late master H. R. Giger, known throughout the world simply as “Giger” (pronounced [/ˈɡiːɡər/ ghee-gur]). To be completely truthful, I would now estimate that Giger is possibly more famous than several of these creators are, and his work is, in many ways, more instantly recognizable (and imitated) by a broader swath of people than likely any artist now living, a trend that began in his lifetime. In the past, visual artists were reliant on patrons to create. This system later evolved away from just the wealthiest in society commissioning a portrait in the pre-photography world, or relenting to the demands of the Catholic Church, and toward the modern conception of artistic patronage by way of corporations. Especially after the Second World War, this would come to include the employment of well-known and readily identifiable artists for promotion and cinema, the latter destined to become the dominant mode of artistic expression in the world (later displaced by television in modern Western culture). As has been the case with several of his contemporaries—Roger Dean, Robert Venosa, Ernst Fuchs, Robert Williams—Giger started his career with a profound interest in design and architecture, and was deeply influenced by the emergent popular cultural movements after WWII ended (especially the Sexual Revolution and the rise of Feminism, new musical expressions, and the revolt against authoritarian governance). Travel was an important (and easier to realize) part of this new aesthetic, which served to enrich an artist’s view of the world and their place in it. Additionally, as most of this new breed of visual explorers did, Giger dabbled in personal musical expression (playing instruments and working with obscure and prominent acts alike). It is, therefore, not surprising that his muse (and immense talent) would at some point lead to Hollywood, and his interest in film (which he had nurtured even as a young man) would springboard his greatest commercial success (screenwriter Dan O’Bannon’s creation of Alien , and Giger’s Academy Award-winning creature designs), as well as bring him incredible recognition and acclaim worldwide for his visceral, singular vision. 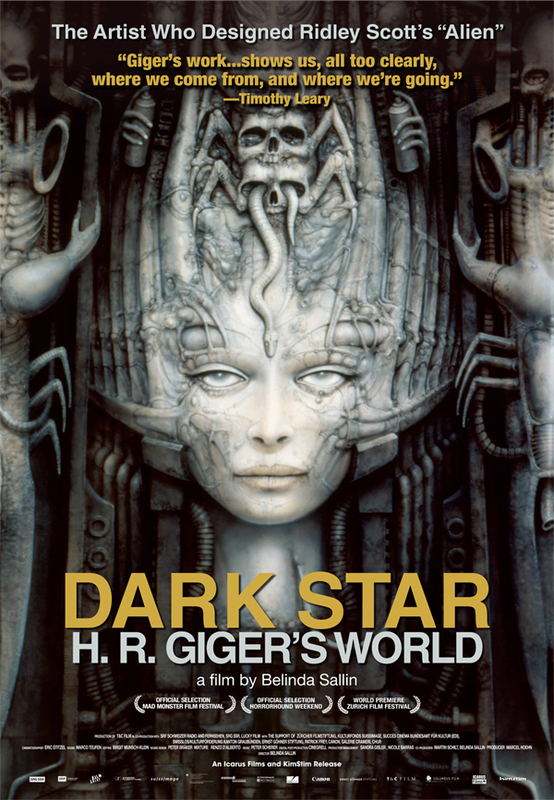 In the documentary Dark Star: H. R. Giger’s World (the title of which also serves as an effective homage to Dan O’Bannon and John Carpenter’s film of the same name), filmmaker Belinda Sallin brings much of these insights to bear with respect to the brilliant artist’s output. 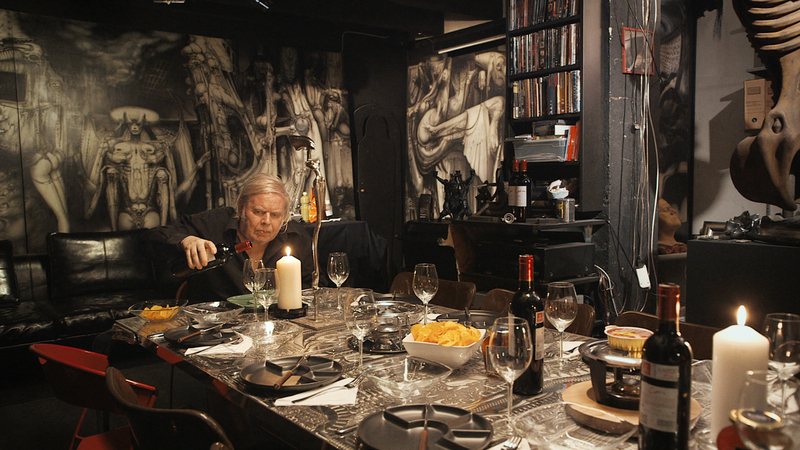 Completed just before Giger’s untimely death due to injuries suffered in a fall at his home in 2014, the film is a thoughtful rumination on the day-to-day existence of this most existential and influential of all modern artists. Sallin presents Giger in a sympathetic and approachable light—surrounding him with friends, family, pets—and does a nice job of contrasting his apparent tranquility with the darkness of his output creatively, especially his earliest conceptions. At times, the movie seems a bit slow, and the narrative too subtle, but this is a minor quibble: The subject more than makes up for any deficiencies in this aspect. The most fascinating parts of the film, aside from hearing Giger discuss his philosophies and his imagery itself—the beautiful grotesqueries of his biomechanoid, psychosexual nightmares—are the sections detailing his childhood and the relationships with his parents, especially his mother. Women always played a prominent role in his life, and seeing him with his mother—as well as the complex interactions with his former lovers and wives—was extremely informative and compelling, even wistful. These moments serve to humanize a man that many have deified—which is understandable in one sense, but unfair in so many others. Giger was not, after all, monolithic and easy to grasp; he was introspective, sensitive, and deserved to be understood and appreciated as an individual with dreams, hopes, and insecurities just like anyone else. The interviews with his widow Carmen Scheifele-Giger, and his longtime companions and friends such as Tom Gabriel Fischer (of Celtic Frost and Triptykon fame), Leslie Barany, and others, are also enjoyable and revealing. They each, in differing ways, provide deeper understanding of a virtuoso creator, one who has come not only to represent and encapsulate much of the post-modern angst and ethos of our troubled times, but who also captured a sublime wonder and magnificence in the decay of humanity. It is a tragedy that he was taken away so early, but a joy he lived at all.